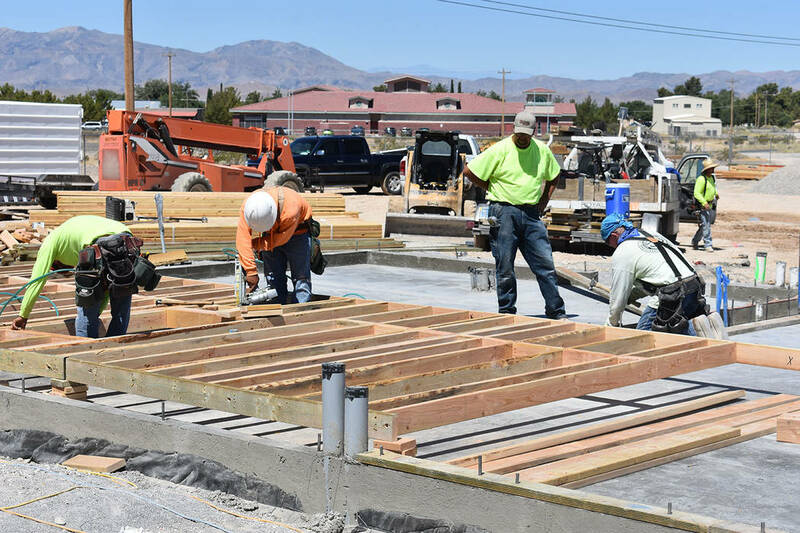 The construction of Jack in the Box is underway in Pahrump with the foundation and utilities already in the ground. 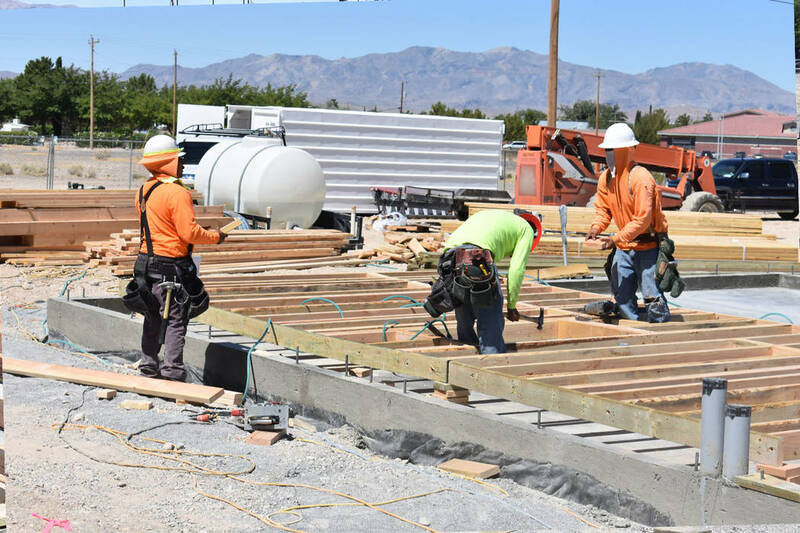 Daria Sokolova/Pahrump Valley Times The construction of Jack in the Box is underway in Pahrump with the foundation and utilities already in the ground as shown in this Wednesday photo. Daryl Koepnick, the construction manager at CM Builders, said the effort started about a month ago and is expected to be finished mid-August ahead of schedule. 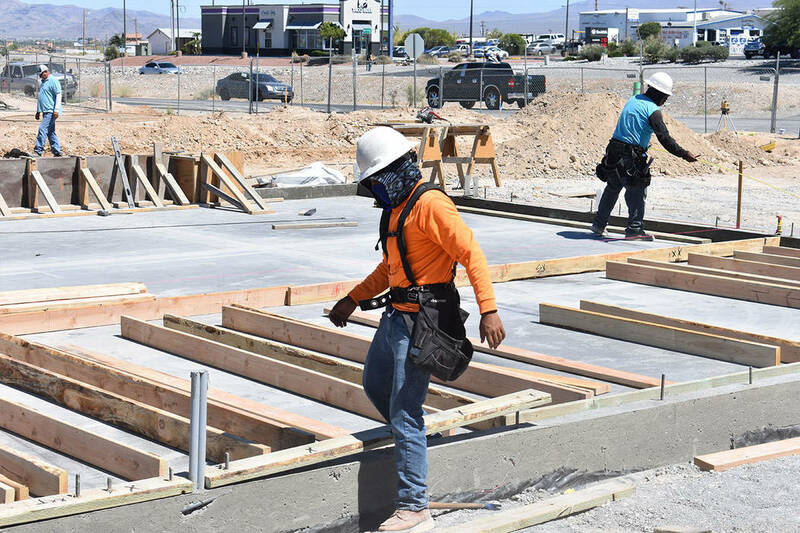 Daria Sokolova/Pahrump Valley Times The construction of the first Jack in the Box has been going on for about a month, and officials said it will be completed mid-August when it will be turned over to a franchisee. This photo was taken Wednesday. Daria Sokolova/Pahrump Valley Times Builders work on the foundation of the Jack in the Box fast-food restaurant on Wednesday. The construction of Pahrump's first Jack in the Box started about a month ago. CM Builders, a Las Vegas-based commercial general construction company, started laying the foundation and utilities. About 16 construction workers were laying the base of the restaurant and turning over the soil on the 2,852-square-foot building area under the scorching sun on Wednesday morning. The fast food restaurant’s address is at 640 S. Highway 160 in Pahrump between China Wok Buffet and Tire Works. Daryl Koepnick, construction manager at Las Vegas-based CM Builders that is tasked with the building of the restaurant, said the construction started about a month ago and is expected to be finished in mid-August ahead of schedule. “Once I get building final, I’m done. Then it goes into the franchisee’s hands and it’s up them whenever they want to open it,” Koepnick said. The next stage of construction is framing, building and finishing utilities, he said. “When you have a fast food restaurant, it typically takes anywhere from 10 to 16 weeks, that’s the ball park,” Koepnick said. CM Builders hired contractors from Pahrump to work on the site, Koepnick said. Trio Desert Investments, LLC, a Las Vegas investment group, purchased one acre of land in January 2016 for $600,000 according to the Nye County Assessor’s records, as reported by the Pahrump Valley Times in January. The acre of land was originally two half-acre plots, which were joined together when Trio Desert Investments bought the land. Cheryl Beeman, Nye County principal planner, said Trio Desert Investments, LLC, in conjunction with a developer, most recently obtained an encroachment permit. The site development plan for the property was ready in February. The building permit also has been approved recently. “I know a lot of people are happily awaiting their opening,” Beeman said. Jack in the Box representatives didn’t immediately return a request for comment earlier this week.